Raw, thrilling and extraordinary: a journey through the wilds of Patagonia is unparalleled. Hike to the edges of glaciers, where ice cracks and rumbles around you. Journey to a ranch at the end of the world. And inhale the sheer enormity of physical space that will get your heart racing. In Patagonia, this is just the tip of the iceberg. Day 1: Arrive Ushuaia, Argentina. Welcome to the southernmost city on Earth, or as locals boast: “El fin del mundo” (The end of the world). Once known as the Siberia of Argentina, Ushuaia is today a charming gateway to the Patagonian paradise of Tierra del Fuego. Get straight to the heart of the city’s beguiling history at the military prison, where tales of the most notorious residents will astonish and amaze. Your hotel is set on a magnificent outcrop high above the city inside the Reserva Natural Cerro Alarkén, just a few minutes from downtown Ushuaia. Journey into Tierra del Fuego’s extreme remoteness. Stop at the region’s oldest ranch, Estancia Harberton, located on a peninsula jutting out into the gunboat-grey Beagle Channel. Sail to Isla Martillo and walk among the enchanting native Magellanic penguins, as well as smaller colonies of gentoo and king penguins. Continue to the far-flung Gable Island for a rustic lunch before your return trip (B,L). Day 3: Design Your Day Ushuaia. Spend your day exploring the Tierra del Fuego National Park, the southernmost example of the Andean–Patagonian forest, and discover why the fabled “land of fire” has fascinated intrepid explorers for centuries. Ride the historic railroad across the narrow gorge of the Cañadon del Toro to the national park. Discover the true wonders of the remote and rugged archipelago on foot and by canoe. Or trek into the wild forest of Cerro Alaquen (B). Day 4: Ushuaia – El Calafate. Journey onwards to El Calafate by flight*, the gateway to Los Glaciares National Park. Soak in the atmosphere of this lakeside oasis in the middle of the barren Patagonian landscape. Spend time in your luxury accommodation or take a short stroll to the nearby ecological reserve, Lake Nimez, to spot Chilean flamingos (B). Venture to the Perito Moreno Glacier, a five-kilometre wide, 60-kilometre long and 70-metre high wall of ice that dramatically ends in Lake Argentino. Drink in one of the most spectacular natural sights on earth with walkways that put you just metres from the ice. Reflect on the spectacle and listen for rumbles as the glacier breaks and shifts. Cruise across Lake Rico to witness icebergs calving off the massive ice sheet, which is one of the few remaining advancing glaciers in the world (B,L). Day 6: El Calafate – Puerto Natales, Chile. Travel to Cerro Castillo on the Chilean border and cross over to Puerto Natales, a city at the edge of Chilean Patagonia. Your base here is a unique hotel located in a converted cold-storage plant built in 1915. Soak up the atmosphere of this quaint fishing town with its hip eateries and shops, and weigh up the many options for exploring the Torres del Paine National Park. Torres del Paine National Park is 242,000 hectares of geological and glacial magnificence in Chile’s wedge of Patagonia. Here, it’s easy to see how Patagonia enlightened the young, inquisitive Charles Darwin and inspired aviator and author Antoine de Saint-Exupéry. This afternoon, start your adventure with your choice of exclusive expeditions and activities (B,L,D). Choose from The Singular’s menu of 20 expeditions into the otherworldly landscape of granite spires, ice and deserted pampas that is Torres del Paine. Sail through the Patagonian Fjords and marvel at the Balmaceda and Serrano glaciers. Observe the prolific wildlife, including flamingo, condor and guanaco – a llama-like native of South America and tasty bait for pumas. Meet local Patagonians and learn their way of life. Trek far off the beaten path and see firsthand how the jagged granite ridges and spires are magnificently serrated. Celebrate your discoveries the Patagonian way – with a feast of meats barbecued over hot coals (B,L,D). Day 9: Puerto Natales – Santiago. 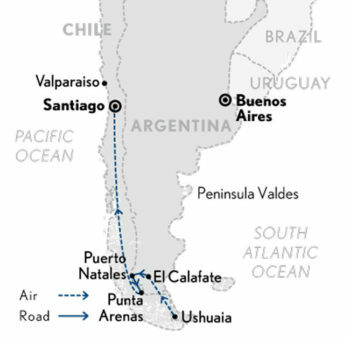 Journey to Punta Arenas and fly* onwards to Santiago where your journey ends (B).